What is an Overshot Gate ? The Overshot Gate is simply an overflow style adjustable weir. It consists of a rectangular steel panel, hinged across the bottom, which is raised and lowered by two cables attached to the upper corners of the gate leaf. Basically, liken it to a drawbridge placed in a canal. 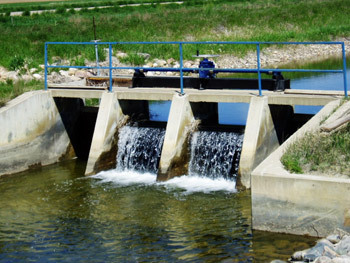 The upstream water level is controlled (and can be measured) by raising or lowering the gate leaf via the cable hoist system which can be operated either manually or electrically. Hydraulically, the overshot gate is a moveable weir. -	A gate leaf that is either painted steel, aluminum or stainless steel. -	A piano style hinge c/w a bronze rod. -	A sill anchoring embedment. -	Cable hoist system consist of; two wire rope cables, machined drums, cross shaft and gearbox all shipped to site fully assembled on a self contained hoist frame. -	Cable hoist can be powered using single, three phase power and a self contained solar power system.